The worker in this photo may as well be digging his own grave. His yellow hard hat is a pathetically inadequate safety device given the extreme danger that surrounds him. He is alone at the bottom of a 7m vertical trench. Excavated soil has been stockpiled at the very edge of the trench adding to the pressure on the trench walls. Vibration from machines working in the area of the trench increases the likelihood of a cave in (premature internment). Neither a ramp, nor ladder has been provided for the worker to escape. Finally, there is nothing to prevent the trench from caving in: no battering of walls; no shoring or shielding of the worker. Unfortunately, this is an all too common practice in trench /excavation work. So what is the law regarding excavations? In New Zealand, Health & Safety Regulations require notification be given to the HSE inspector if trenches are deeper than 1.5m. Requirements and options for safe trenching are given in the New Worksafe Good Practice Guidelines for Excavation Safety. Click here for a PDF of the "Health and Safety in Employment Regulations 1995". 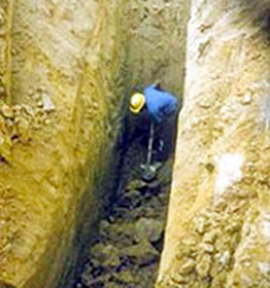 0800 SHORENZ (0800 746 7369) for our expert opinion or email Trench Shoring Enquiries.